The LdS Church has a dirty little secret: The Book of Mormon not only doesn’t teach current Mormon doctrine, it discredits much of it. – God the Father was once a man, on another world (Kolob), and progressed to godhood by following perfectly the commands and precepts of his Father God. And I do this that I may prove unto many that I am the same yesterday, today, and forever; and that I speak forth my words according to mine own pleasure. And because that I have spoken one word ye need not suppose that I cannot speak another; for my work is not yet finished; neither shall it be until the end of man, neither from that time henceforth and forever. For do we not read that God is the same yesterday, today, and forever, and in him there is no variableness neither shadow of changing? For behold, God knowing all things, being from everlasting to everlasting, behold, he sent angels to minister unto the children of men, to make manifest concerning the coming of Christ; and in Christ there should come every good thing. The Lectures on Faith, which was a canonized part of Doctrine & Covenants from 1835-1921, agreed with the Book of Mormon that God is a spirit (from the fifth Lecture on Faith, page 53.) Click on image to zoom and read. – God the Father is a person with a body of flesh and bones. 26 And then Ammon said: Believest thou that there is a Great Spirit? 9 And the king said: Is God that Great Spirit that brought our fathers out of the land of Jerusalem? 10 And Aaron said unto him: Yea, he is that Great Spirit, and he created all things both in heaven and in earth. Believest thou this? 11 And he said: Yea, I believe that the Great Spirit created all things, and I desire that ye should tell me concerning all these things, and I will believe thy words. 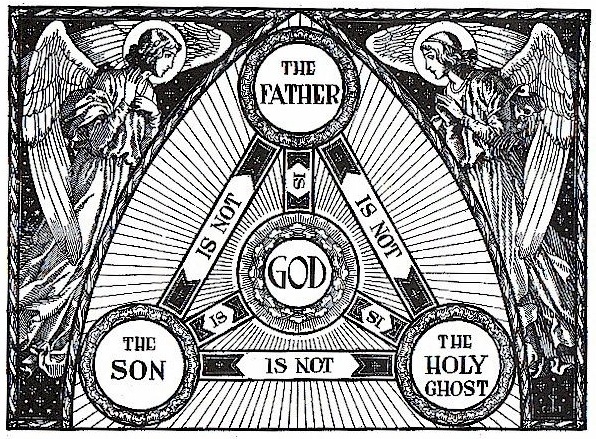 – The Father, Son and Holy Ghost are separate gods, “one in purpose” only but not one in being. Teach them that redemption cometh through Christ the Lord, who is the very Eternal Father. Amen. 2 For behold, the promises which we have obtained are promises unto us according to the flesh; wherefore, as it has been shown unto me that many of our children shall perish in the flesh because of unbelief, nevertheless, God will be merciful unto many; and our children shall be restored, that they may come to that which will give them the true knowledge of their Redeemer. 3 Wherefore, as I said unto you, it must needs be expedient that Christ—for in the last night the angel spake unto me that this should be his name—should come among the Jews, among those who are the more wicked part of the world; and they shall crucify him—for thus it behooveth our God, and there is none other nation on earth that would crucify their God. 4 For should the mighty miracles be wrought among other nations they would repent, and know that he be their God. 5 But because of priestcrafts and iniquities, they at Jerusalem will stiffen their necks against him, that he be crucified. 6 Wherefore, because of their iniquities, destructions, famines, pestilences, and bloodshed shall come upon them; and they who shall not be destroyed shall be scattered among all nations. 7 But behold, thus saith the Lord God: When the day cometh that they shall believe in me, that I am Christ, then have I covenanted with their fathers that they shall be restored in the flesh, upon the earth, unto the lands of their inheritance. God the Father and Jesus Christ, by Mormon Artist Del Parson. This is not what the Book of the Mormon teaches about God’s nature. And as I spake concerning the convincing of the Jews, that Jesus is the very Christ, it must needs be that the Gentiles be convinced also that Jesus is the Christ, the Eternal God. 40 And he shall come into the world to redeem his people; and he shall take upon him the transgressions of those who believe on his name; and these are they that shall have eternal life, and salvation cometh to none else. Therefore, I would that ye should be steadfast and immovable, always abounding in good works, that Christ, the Lord God Omnipotent , may seal you his, that you may be brought to heaven, that ye may have everlasting salvation and eternal life, through the wisdom, and power, and justice, and mercy of him who created all things, in heaven and in earth, who is God above all . Amen. Have they not said that God himself should come down among the children of men, and take upon him the form of man, and go forth in mighty power upon the face of the earth? 31 And he said: An angel hath made them known unto me. 34 And Zeezrom said again: Shall he save his people in their sins? And Amulek answered and said unto him: I say unto you he shall not, for it is impossible for him to deny his word. 35 Now Zeezrom said unto the people: See that ye remember these things; for he said there is but one God; yet he saith that the Son of God shall come, but he shall not save his people—as though he had authority to command God. 37 And I say unto you again that he cannot save them in their sins; for I cannot deny his word, and he hath said that no unclean thing can inherit the kingdom of heaven; therefore, how can ye be saved, except ye inherit the kingdom of heaven? Therefore, ye cannot be saved in your sins. …and it states plainly that One God consists of the Father, Son and Holy Spirit – that is, the Book of Mormon teaches the doctrine of the Trinity (albeit with a strong modalistic skew). – Heavenly Father and Jesus Christ physically appeared to Joseph Smith (aka “The First Vision”). Further the Book of Mormon teaches that God the Father is a spirit not a physical being. – God the Father, Jesus Christ, Joseph Smith and other sons of the Father did not create the universe and earth out of nothing, but “organized” them from eternally existing matter that pre-existed God the Father. 9 For behold, by the power of his word man came upon the face of the earth, which earth was created by the power of his word. Wherefore, if God being able to speak and the world was, and to speak and man was created, O then, why not able to command the earth, or the workmanship of his hands upon the face of it, according to his will and pleasure? – The LdS Church teaches that the most faithful and worthy Mormons can progress to godhood in the highest degree of the Celestial Kingdom, where they can obtain their own world and with their wife (or wives) procreate spirit children for eternity. This is known as “Celestial Exaltation”. And LdS Scripture (in Doctrine & Covenants 132) states that the “new and everlasting covenant” of polygamy is necessary for this exaltation to godhood. And now it came to pass that the people of Nephi, under the reign of the second king, began to grow hard in their hearts, and indulge themselves somewhat in wicked practices, such as like unto David of old desiring many wives and concubines, and also Solomon, his son. Behold, the Lamanites your brethren, whom ye hate because of their filthiness and the cursing which hath come upon their skins, are more righteous than you; for they have not forgotten the commandment of the Lord, which was given unto our father—that they should have save it were one wife, and concubines they should have none, and there should not be whoredoms committed among them. For behold, he did not keep the commandments of God, but he did walk after the desires of his own heart. and he had many wives and concubines. And he did cause his people to commit sin, and do that which was abominable in the sight of the Lord. Yea, and they did commit whoredoms and all manner of wickedness. And it came to pass that Riplakish did not do that which was right in the sight of the Lord, for he did have many wives and concubines, and did lay that upon men’s shoulders which was grievous to be borne; yea, he did tax them with heavy taxes; and with the taxes he did build many spacious buildings. And there is a place prepared, yea, even that awful hell of which I have spoken, and the devil is the foundation of it; wherefore the final state of the souls of men is to dwell in the kingdom of God, or to be cast out because of that justice of which I have spoken. – Every human being will find a place in one of the three degrees of glory (or “heaven” in plain English). This doctrine is a form of universalism which The Book of Mormon denounces as a “false doctrine”. 4 And he [Nehor] also testified unto the people that all mankind should be saved at the last day, and that they might lift up their heads and rejoice; for the Lord had created all men, and had also redeemed all men; and, in the end, all men should have eternal life. 12 But Alma said unto him; Behold, this is he first time that priestcraft has been introduced among this people. And behold, thou art not only guilty of priestcraft, but hast endeavored to enforce it by the sword; and were priestcraft to be enforced among this people it would prove their entire destruction. 13 And thou has shed the blood of a righteous man; yea, a man who has done much good among the people; and were we to spare thee his blood would come upon us for vengeance. 14 Therefore thou are condemned to die, according to the law which has been given us by Mosiah, our last king; and it has been acknowledged by this people; therefore this people must abide by the law. 15 And it came to pass that they took him; and his name was Nehor; and they carried him upon the top of the hill Manti, and there he was caused, or rather did acknowledge, between the heavens and the earth, that what he had taught to the people was contrary to the world of God; and there he suffered and ignominious death. 16 Nevertheless, this did not put an end to the spreading of priestcraft through the land; for there were many who loved the vain things of the world, and they went forth preaching false doctrines; and this they did for the sake of riches and honor. – The only people not in one of the three degrees of glory will be the Devil and his angels as well as those Mormons who have held the priesthood and become apostate. The latter are referred to as “the sons of perdition” in Mormon doctrine. And that great pit, which hath been digged for them by that great and abominable church, which was founded by the devil and his children, that he might lead away the souls of men down to hell — yea, that great pit which hath been digged for the destruction of men shall be filled by those who digged it, unto their utter destruction, saith the Lamb of God; not the destruction of the soul, save it be the casting of it into that hell which hath no end. 35 And there is a place prepared, yea, even that awful hell of which I have spoken, and the devil is the preparator of it; wherefore the final state of the souls of men is to dwell in the kingdom of God, or to be cast out because of that justice of which I have spoken. 19 O the greatness of the mercy of our God, the Holy One of Israel! For he delivereth his saints from that awful monster the devil, and death, and hell, and that lake of fire and brimstone, which is endless torment. 21 And others will he pacify, and lull them away into carnal security, that they will say: All is well in Zion; yea, Zion prospereth, all is well — and thus the devil cheateth their souls, and leadeth them away carefully down to hell. 22 And behold, others he [the devil] flattereth away, and telleth them there is no hell; and he saith unto them: I am no devil, for there is none — and thus he whispereth in their ears, until he grasps them with his awful chains, from whence there is no deliverance. 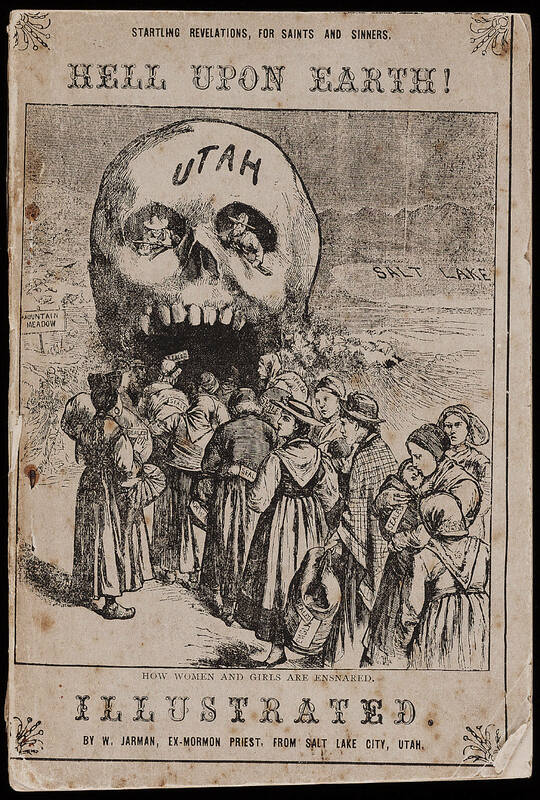 19th Century Anti-Mormons had their own ideas about where Mormon hell was and who resided there. And also it is that same being who put it into the hearts of the people to build a tower sufficiently high that they might get to heaven. And it was that same being who led on the people who came from that tower into this land; who spread the works of darkness and abominations over all the face of the land, until he dragged the people down to an entire destruction, and to an everlasting hell. 37 I say unto you, that the man that doeth this, the same cometh out in open rebellion against God; therefore he listeth to obey the evil spirit, and becometh an enemy to all righteousness; therefore, the Lord has no place in him, for he dwelleth not in unholy temples. – Temples and temple ordinances pertaining to endowments are necessary in order to pass through the veil and enter the presence of God the Father, and consist of Temple Marriage, new names, secret key words and handshakes that will be used as an identification of the person in the next life. Specifically, it states that it is Satan who puts it into the hearts of the people to form secret oaths and covenants. It also states that secret combinations aren’t the work of God, are forbidden, are a form of evil, are destructive, and lead to God’s judgment. 23 Wherefore, O ye Gentiles, it is wisdom in God that these things should be shown unto you, that thereby ye may repent of your sins, and suffer not that these murderous combinations shall get above you, which are built up to get power and gain—and the work, yea, even the work of destruction come upon you, yea, even the sword of the justice of the Eternal God shall fall upon you, to your overthrow and destruction if ye shall suffer these things to be. 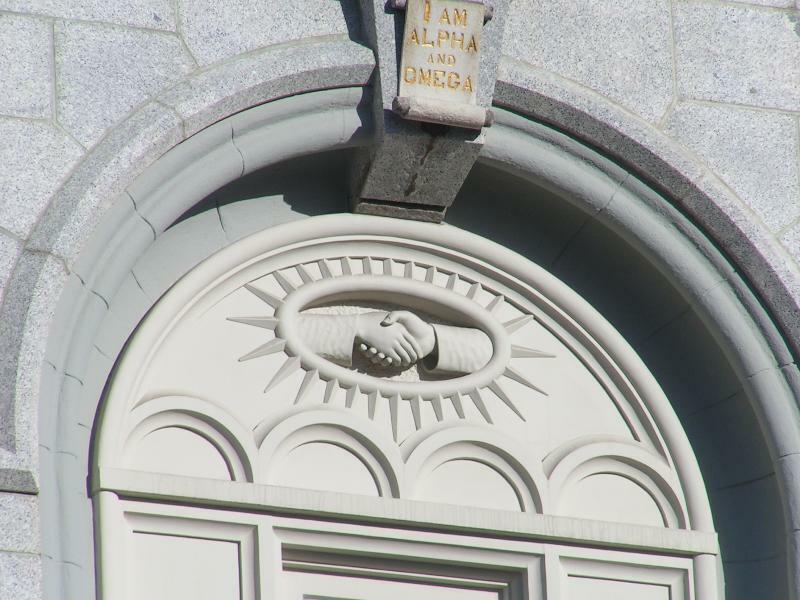 A handshake engraved onto the SLC Temple – symbolic of the “secret combinations” used in the LdS Temple Endowment Ceremony. 21 But behold, Satan did stir up the hearts of the more part of the Nephites, insomuch that they did unite with those bands of robbers, and did enter into their covenants and their oaths, that they would protect and preserve one another in whatsoever difficult circumstances they should be placed, that they should not suffer for their murders, and their plunderings, and their stealings. 22 And it came to pass that they did have their signs, yea, their secret signs, and their secret words; and this that they might distinguish a brother who had entered into the covenant, that whatsoever wickedness his brother should do he should not be injured by his brother, nor by those who did belong to his band, who had taken this covenant. 23 And thus they might murder, and plunder, and steal, and commit whoredoms and all manner of wickedness, contrary to the laws of their country and also the laws of their God. 24 And whosoever of those who belonged to their band should reveal unto the world of their wickedness and their abominations, should be tried, not according to the laws of their country, but according to the laws of their wickedness, which had been given by Gadianton and Kishkumen. 25 Now behold, it is these secret oaths and covenants which Alma commanded his son should not go forth unto the world, lest they should be a means of bringing down the people unto destruction. 27 Yea, that same being who did plot with Cain, that if he would murder his brother Abel it should not be known unto the world. And he did plot with Cain and his followers from that time forth. 28 And also it is that same being who put it into the hearts of the people to build a tower sufficiently high that they might get to heaven. And it was that same being who led on the people who came from that tower into this land; who spread the works of darkness and abominations over all the face of the land, until he dragged the people down to an entire destruction, and to an everlasting hell. 29 Yea, it is that same being who put it into the heart of Gadianton to still carry on the work of darkness, and of secret murder; and he has brought it forth from the beginning of man even down to this time. 30 And behold, it is he who is the author of all sin. And behold, he doth carry on his works of darkness and secret murder, and doth hand down their plots, and their oaths, and their covenants, and their plans of awful wickedness, from generation to generation according as he can get hold upon the hearts of the children of men. 29 Therefore ye shall keep these secret plans of their oaths and their covenants from this people, and only their wickedness and their murders and their abominations shall ye make known unto them; and ye shall teach them to abhor such wickedness and abominations and murders; and ye shall also teach them that these people were destroyed on account of their wickedness and abominations and their murders. 30 For behold, they murdered all the prophets of the Lord who came among them to declare unto them concerning their iniquities; and the blood of those whom they murdered did cry unto the Lord their God for vengeance upon those who were their murderers; and thus the judgments of God did come upon these workers of darkness and secret combinations. 31 Yea, and cursed be the land forever and ever unto those workers of darkness and secret combinations, even unto destruction, except they repent before they are fully ripe. Baptismal font in the Salt Lake Temple, circa 1912, where baptisms for the dead are performed by proxy. The font rests on the backs of twelve oxen representing the Twelve Tribes of Israel. – Baptisms for the dead must be performed by proxy in this life for those who did not accept the gospel in this life, so that their sins can be forgiven and they can enter the Celestial Kingdom after they accept the Mormon gospel message in the next life. But remember that he that persists in his own carnal nature, and goes on in the ways of sin and rebellion against God, remaineth in his fallen state and the devil hath all power over him. Therefor he is as thoughthere was no redemption made, being an enemy to God; and also is the devil an enemy to God. Yea, every knee shall bow, and every tongue confess before him. Yea, even at the last day, when all men shall stand to be judged of him, then shall they confess that he is God; then shall they confess, who live without God in the world, that the judgment of an everlasting punishment is just upon them; and they shall quake, and tremble, and shrink beneath the glance of his all-searching eye. 31 Yea, I would that ye would come forth and harden not your hears any longer; for behold, now is the time and the day of your salvation; and therefore, if ye will repent and harden not your hearts, immediately shall the great plan of redemption be brought about unto you. 33 And now, as I said unto you before, as ye have had so many witnesses, therefore, I beseech of you that ye do not procrastinate the day of your repentance until the end; for after this day of life, which is given to us to prepare for eternity, behold, if we do not improve our time while in this life, then cometh the night of darkness wherein there can be no labor performed. 7 These are they that are redeemed of the Lord; yea, these are they that are taken out, that are delivered from that endless night of darkness; and thus they stand or fall; for behold, they are their own judges, whether to do good or do evil. 8 Now, the decrees of God are unalterable; therefore, the way is prepared that whosoever will may walk therein and be saved. 16 Now, repentance could not come unto men except there were a punishment, which also was eternal as the life of the soul should be, affixed opposite to the plan of happiness, which was as eternal also as the life of the soul. The Book of Mormon calls this a “dead work” and states that baptism is not required for little children to be saved. 26 For the atonement satisfieth the demands of his justice upon all those who have not the law given to them, that they are delivered from that awful monster, death and hell, and the devil, and the lake of fire and brimstone, which is endless torment; and they are restored to that God who gave them breath, which is the Holy One of Israel. 25 And little children also have eternal life. – Heavenly Father and Heavenly Mother procreated the spirits of every human being that has lived, is now living or will ever live on this earth. The Book of Mormon states that man was created by the power of God’s word. For behold, by the power of his word man came upon the face of the earth, which earth was created by the power of his word. Wherefore, if God being able to speak and the world was, and to speak and man was created, O then, why not able to command the earth, or the workmanship of his hands upon the face of it, according to his will and pleasure? 36 Now when Ammon had said these words, he began at the creation of the world, and also the creation of Adam, and told him all the things concerning the fall of man, and rehearsed and laid before him the records and the holy scriptures of the people, which had been spoken by the prophets, even down to the time that their father, Lehi, left Jerusalem. – The spirits procreated by Heavenly Father and Heavenly Mother lived with their father on his world as angels in the “pre-existence” before being sent to earth to inhabit human bodies. 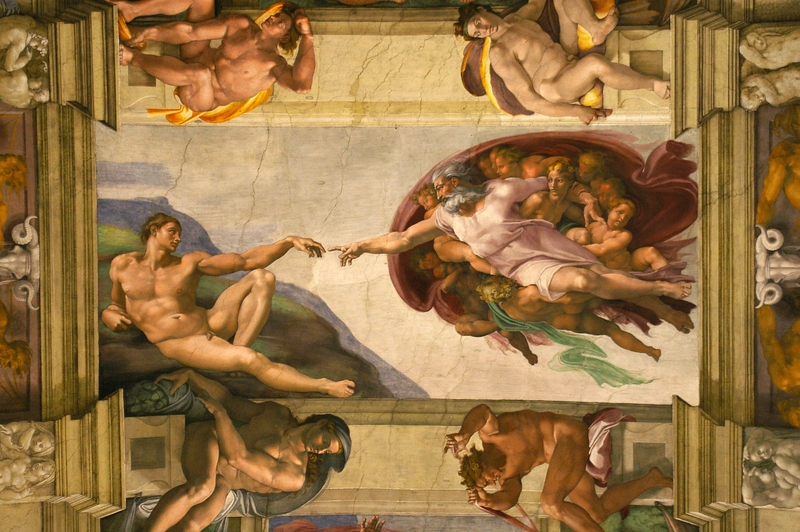 Further it states that man was created (not procreated) and placed on earth by God as his created dwelling place – just as heaven is the created dwelling place of God and his Angels (who were also created, not procreated). 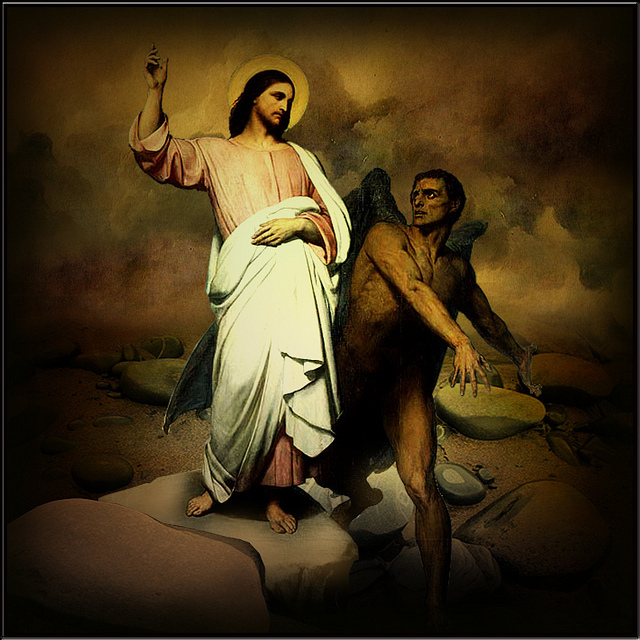 Jesus tempted in the desert by Lucifer. According to current Mormon Doctrine not only are these two brothers, they’re the siblings of all human beings past and present. – Jesus Christ is the brother of Lucifer (Satan), every human being past and present, and the angels. The Book of Mormon teaches that Jesus is Eternal God. And as God, Christ was neither created or procreated. And behold, they began to pray; and they did pray unto Jesus, calling him their Lord and their God. – Jesus Christ made atonement for sins in the Garden of Gethsemane. Yea, I know that ye know that in the body he shall show himself unto those at Jerusalem, from whence we came; for it is expedient that it should be among them; for it behooveth the great Creator that he suffereth himself to become subject unto man in the flesh, and die for all men, that all men might become subject unto him. – Consumption of wine is a violation of a commandment of God (see D&C 89:5) that’s so egregious that it can result in having your access to Latter-day Saint Temples (and thereby your potential for full salvation via Celestial Exaltation) revoked. The Book of Mormon has Christ, the Apostles, and all Christians consuming wine in both sacred and secular fashion. In fact, Christ even commands them and us to consume wine as part of the sacrament. 1 And it came to pass that Jesus commanded his disciples that they should bring forth some bread and wine unto him. 3 And when the disciples had come with bread and wine, he took of the bread and brake and blessed it; and he gave unto the disciples and commanded that they should eat. 5 And when the multitude had eaten and were filled, he said unto the disciples: Behold there shall one be ordained among you, and to him will I give power that he shall break bread and bless it and give it unto the people of my church, unto all those who shall believe and be baptized in my name. 6 And this shall ye always observe to do, even as I have done, even as I have broken bread and blessed it and given it unto you. 7 And this shall ye do in remembrance of my body, which I have shown unto you. And it shall be a testimony unto the Father that ye do always remember me. And if ye do always remember me ye shall have my Spirit to be with you. 8 And it came to pass that when he said these words, he commanded his disciples that they should take of the wine of the cup and drink of it, and that they should also give unto the multitude that they might drink of it. 10 And when the disciples had done this, Jesus said unto them: Blessed are ye for this thing which ye have done, for this is fulfilling my commandments, and this doth witness unto the Father that ye are willing to do that which I have commanded you. 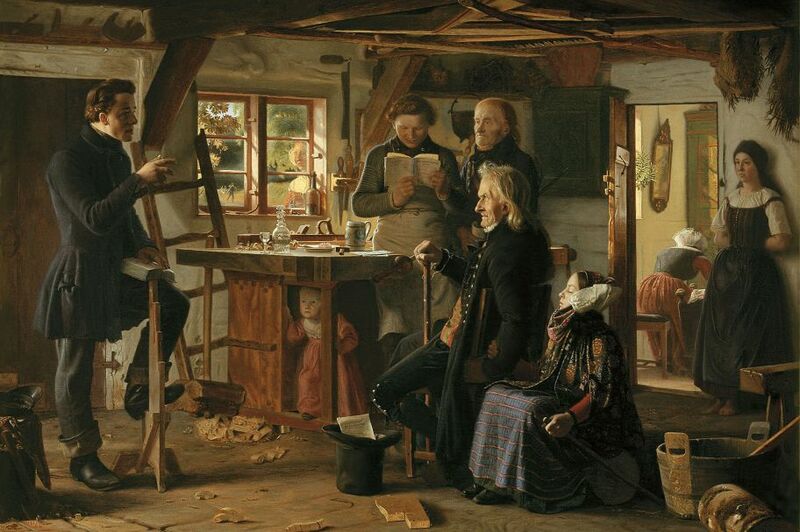 “Mormons visit a country carpenter” (1856) by Christen Dalsgaard, depicting a mid-19th century visit of a missionary to a Danish carpenter’s workshop. The first missionaries arrived in Denmark in 1850. “Studies of Latter-day Saint sermons and curriculum from the earliest period of church history well into the 20th century demonstrate surprisingly little use of the Book of Mormon to establish doctrines or as a text from which to preach. Many Saints were converted by reading it, but, thereafter, they tended to overlook its specific content. 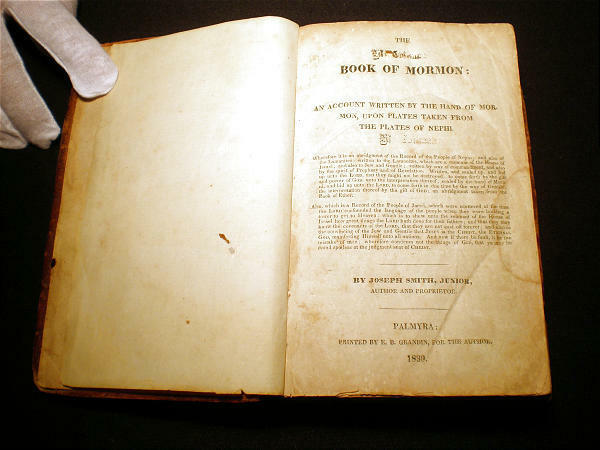 Early members, mostly converts, knew the Bible well and used it extensively in their teaching and missionary efforts, but the Book of Mormon served mainly as a kind of talisman, its sheer existence pointing to Joseph Smith’s prophetic calling. Mr. Peterson is being generous, in actual fact other than passing references to Book of Mormon figures and stories, Joseph Smith never used it in his sermons. 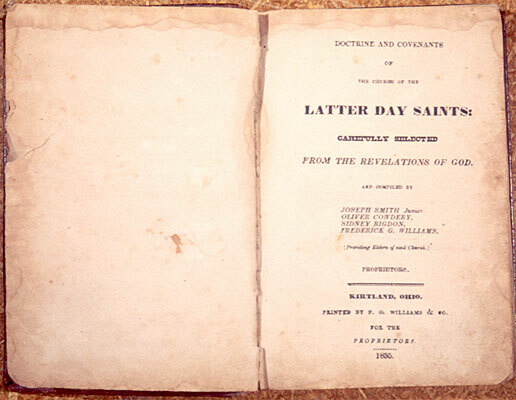 Rather, then as now, the Book of Mormon was used as a kind of proof of Joseph Smith’s prophetic callings via a lengthy but familiar sounding tract. For the uninformed the Book of Mormon can be a powerful recruiting tool. But for the informed that power is quickly lost. 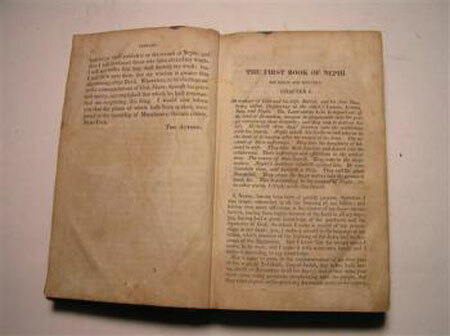 The 0riginal 1830 Book of Mormon was first modified by Joseph Smith and Oliver Cowdery in 1837 and has undergone regular modifications since (most recently in 2013). Some changes have been material – resulting in major theological or meaning change – while others haven’t. John S. Dinger’s excellent introduction to the book “Significant Textual Changes in the Book of Mormon” provides a good overview of these changes. Jim Spencer’s “1830 Book of Mormon Comparison Machine” is a valuable resource for doing a side-by-side comparison of the 1830 and modern editions of the Book of Mormon. The Jacobean English that the Book of Mormon shares with the King James Bible was as far from daily English vernacular then as it is now. However, then like now, it’s peculiar cadence and vocabulary was considered more “holy” than common English – like some kind of special or sanctified religious dialect if you will. For those English speakers looking for a religious experience, speaking in “Jacobean tongues” can feel like grandma’s warm comforter wrapped up around “that old time religion” – it feels like home. This is especially true when combined with the polished, HeartSell spin doctored marketing that’s delivered to the investigator through the Mormon Missionary lessons contained in the LdS Church’s “Preach My Gospel” curriculum. Mormon Researcher Sharon Lindbloom’s article, “Strategic Emotional Advertising”, offers a good primer of how the LdS Church uses HeartSell in recruiting and retaining members. And while the language is strong (and the editorial comments even stronger) Mormon Expression podcast #250 offers a thorough overview and analysis of how HeartSell works and how it saturates all aspects of Mormon Church culture. The author would like to acknowledge the following internet web pages – which this article was inspired by, based on, and built from: “Current Mormon Doctrines Not Found in the Book of Mormon” and “Contradictions in LDS Scriptures”. However, they also fail to tell you that very little Mormon doctrine can actually be found in the Book of Mormon – the vast majority is found elsewhere. For example, look at the three common claims that were made in the first paragraph above (the ones in quotes). The first is from another book of LdS Scripture known as “Doctrine & Covenants” (D&C 20:9 and D&C 27:5) and the third is from Joseph Smith’s “History of the Church” (Volume 2, Page 52). Only the second quote is actually from the Book of Mormon – and it’s from the introduction not the central narrative. But that said, one needn’t wait: Not only will this article tell you some of the “weird stuff” that’s not in the Book of Mormon, but it will also show you where to find it for yourself. 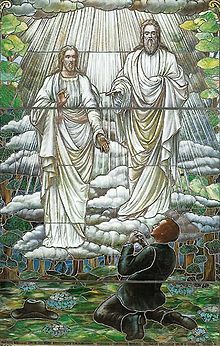 Stained glass depiction of the first vision of Joseph Smith, Jr., completed in 1913 by an unknown artist (Museum of Church History and Art). 16 But, exerting all my powers to call upon God to deliver me out of the power of this enemy which had seized upon me, and at the very moment when I was ready to sink into despair and abandon myself to destruction – not to an imaginary ruin, but to the power of some actual being from the unseen world, who had such marvelous power as I had never before felt in any being – just at this moment of great alarm, I saw a pillar of light exactly over my head, above the brightness of the sun, which descended gradually until it fell upon me. 17 It no sooner appeared than I found myself delivered from the enemy which held me bound. When the light rested upon me I saw two Personages, whose brightness and glory defy all description, standing above me in the air. One of them spake unto me, calling me by name and said, pointing to the other – This is My Beloved Son. Hear Him! – All other churches and their leaders are in a state of corrupt apostasy (aka “The First Vision”). 18 My object in going to inquire of the Lord was to know which of all the sects was right, that I might know which to join. No sooner, therefore, did I get possession of myself, so as to be able to speak, than I asked the Personages who stood above me in the light, which of all the sects was right (for at this time it had never entered into my heart that all were wrong) – and which I should join. – The Priesthood is necessary in order for men to receive authority to act in the name of God and perform the various duties necessary to carry out the ordinances of the gospel. “In order to gain exaltation a man must obtain, then magnify, the holy priesthood. For whoso is faithful unto the obtaining these two priesthoods of which I have spoken, and the magnifying their calling, are sanctified by the Spirit unto the renewing of their bodies. ‘They become the elect of God. ‘And therefore all that my Father hath shall be given unto him. “If Abraham reasoned thus—If Jesus Christ was the Son of God, and John discovered that God the Father of Jesus Christ had a Father, you may suppose that He had a Father also. Where was there ever a son without a father? And where was there ever a father without first being a son? Whenever did a tree or anything spring into existence without a progenitor? And everything comes in this way. Paul says that which is earthly is in the likeness of that which is heavenly, Hence if Jesus had a Father, can we not believe that He had a Father also? I despise the idea of being scared to death at such a doctrine, for the Bible is full of it. “From the Prophet’s account of the First Vision and from his other teachings, we know that the members of the Godhead are three separate beings. The Father and the Son have tangible bodies of flesh and bones, and the Holy Ghost is a personage of spirit (see D&C 130:22). “The Church’s first article of faith states, “We believe in God, the Eternal Father, and in His Son, Jesus Christ, and in the Holy Ghost.” These three beings make up the Godhead. They preside over this world and all other creations of our Father in Heaven. A Mormon “Quad” (all four books of LdS scripture in one bound volume) open to the Pearl of Great Price. – God is married and has at least one wife in heaven. – The Most faithful and worthy Mormons can progress to godhood in the highest degree of the Celestial Kingdom, where they can obtain their own world and with their wife (or wives) procreate spirit children for eternity. 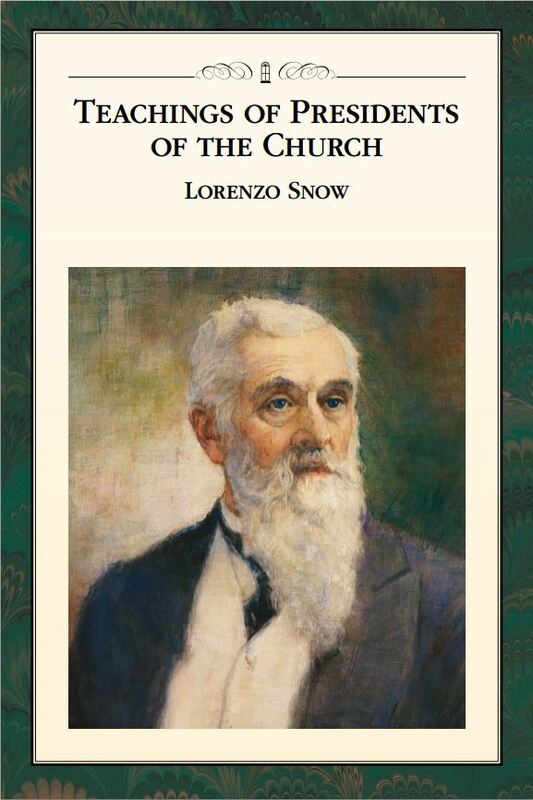 The official LdS Church manual, “Teachings of the Presidents of the Church: Lorenzo Snow”, his famous couplet can be found on page 83. – The “new and everlasting covenant” of polygamy is necessary for exaltation to godhood. – Mormons who are unmarried in this life and do not marry in the next life, cannot be exalted, but will become servant ministering angels to exalted Mormons in the next life. 71 And again, we saw the terrestrial world, and behold and lo, these are they who are of theterrestrial, whose glory differs from that of the church of the Firstborn who have received the fulness of the Father, even as that of the moon differs from the sun in the firmament. 77 These are they who receive of the presence of the Son, but not of the fulness of the Father. 88 And also the telestial receive it of the ministering of angels who are appointed to minister for them, or who are appointed to be ministering spirits for them; for they shall be heirs of salvation. “Latter-day revelations speak of hell in at least two ways. First, it is another name for spirit prison, a temporary place in the postmortal world for those who died without a knowledge of the truth or those who were disobedient in mortality. Second, it is the permanent location of Satan and his followers and the sons of perdition, who are not redeemed by the Atonement of Jesus Christ. Spirit prison is a temporary state in which spirits will be taught the gospel and have the opportunity to repent and accept ordinances of salvation that are performed for them in temples (see D&C 138:30-35). 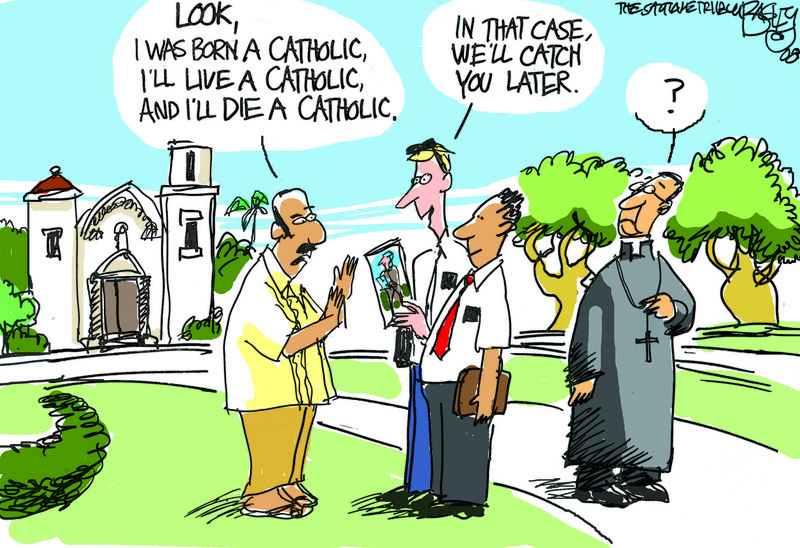 Those who accept the gospel may dwell in paradise until the Resurrection. After they are resurrected and judged, they will receive the degree of glory of which they are worthy. Those who choose not to repent but who are not sons of perdition will remain in spirit prison until the end of the Millennium, when they will be freed from hell and punishment and be resurrected to a telestial glory (see D&C 76:81-85). “The scriptures explain who the sons of perdition are and what their fate will be. 1. Satan and the one-third of the hosts of heaven who followed him became sons of perdition (see D&C 76:25-30; 29:36–38; Revelation 12:7–9; 2 Peter 2:4; Jude 1:6). 2. Those who in mortality have known the power of God, been made partakers of it, and then later denied the truth and defied God’s power will also be sons of perdition (see D&C 76:31–32). 3. Those who deny the Holy Ghost after having received it and crucify the Savior unto themselves will have no forgiveness and will be sons of perdition (see D&C 76:34–36; Matthew 12:31–32). 4. Sons of perdition will suffer the wrath of God and partake of the second death (see D&C 76:33, 37–38). Those who become sons of perdition in mortality will be resurrected but will not be redeemed in a kingdom of glory (see D&C 76:38–39, 43–44; 88:24, 32). “With this garment, I give you a new name, which you should always remember and which you must keep sacred and never reveal, except at a certain place that will be shown you hereafter. PETER: We will now give unto you the first token of the Melchizedek priesthood, or Sign of the Nail, with its accompanying name, sign, and penalty. We desire all to receive it. All arise. I will now explain the covenant and obligation of secrecy which are associated with this token, its name, sign, and penalty, which you will be required to take upon yourselves. The first token of the Melchizedek priesthood, or Sign of the Nail. PETER: The first token of the Melchizedek priesthood, or Sign of the Nail. LORD: Has it a name? LORD: Will you give it to me? PETER: I will, through the veil. An LdS Temple baptismal Font. 15 And now, my dearly beloved brethren and sisters, let me assure you that these are principles in relation to the dead and the living that cannot be lightly passed over, as pertaining to our salvation. For their salvation is necessary and essential to our salvation, as Paul says concerning the fathers – that they without us cannot be made perfect – neither can we without our dead be made perfect. Mormon.org Frequently Asked Questions: Why do Mormons perform baptisms for the dead? “We lived as spirit children of God in a premortal existence. 1. God is the father of the spirits of all mankind (see Hebrews 12:9; D&C 76:24; Acts 17:29; Romans 8:16). 2. Our spirit bodies are in the form of God’s physical body (see D&C 77:2; Ether 3:6–16). 3. Our instruction and preparation for earth life began in the world of spirits (see D&C 138:56). 4. 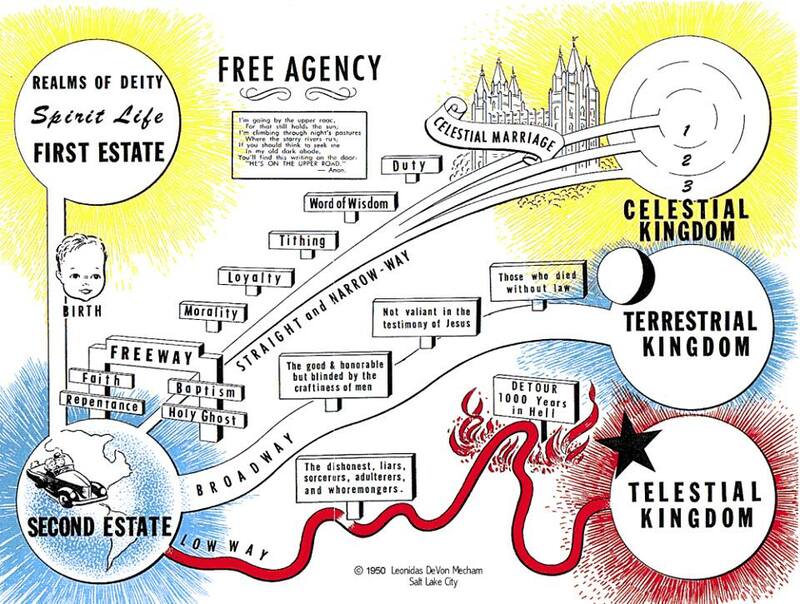 God gave us agency in the premortal life (see Moses 4:3; D&C 29:36). 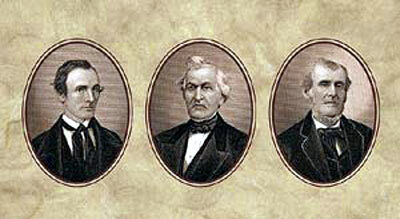 Further, as we noted in “A Documented History of Joseph Smith’s First Vision” the LdS Church didn’t even publish the First Vision account that Mr. Hinckley and Mormon Missionaries depend so heavily on until March 15, 1842 – nearly twelve years after the publication of the Book of Mormon – and even then, it wasn’t canonized as a part of LdS Scripture until October 10, 1880, over 50-years after Joseph Smith brought the Book of Mormon and his new religion forth. And the other “Missing In Action” Book of Mormon doctrines that we’ve addressed here, while perhaps not as vital as the First Vision, are still critical to modern Latter-day Saint theology. Simply put, take them away and Mormonism ceases being the unique, one-of-a-kind religion that is it and becomes irrelevant. That will be the topic of our next article where we’ll then demonstrate how the Book of Mormon actually contradicts these unique Mormon doctrines and, instead, teaching something surprisingly – perhaps even shockingly – different. Oh by the way, we got all those quotes from chapter 5 of “Preach My Gospel” the LdS Church’s official training manual for it’s missionaries. Please don’t take the author’s word for it, watch it yourself by clicking here (hidden camera video of the entire LdS Temple endowment Ceremony) or here (full transcript of the entire LdS Temple endowment ceremony). 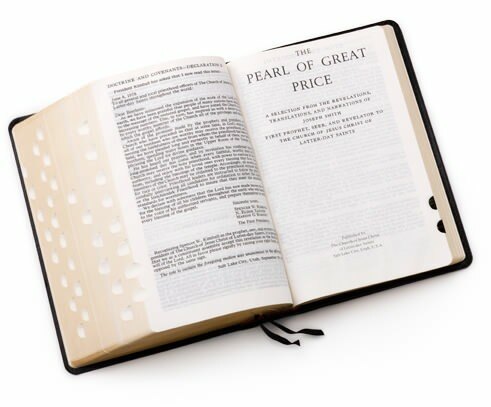 “The Pearl of Great Price is a selection of choice materials touching many significant aspects of the faith and doctrine of The Church of Jesus Christ of Latter-day Saints. 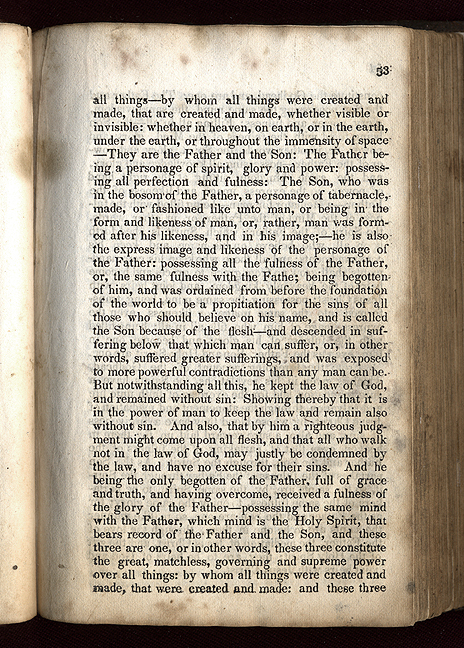 These items were translated and produced by the Prophet Joseph Smith, and most were published in the Church periodicals of his day. The author would like to acknowledge the following internet web page – which this article was inspired by, based on, and built from: “Current Mormon Doctrines Not Found in the Book of Mormon”.